Large-scale 3D printing is slowly coming to the fore as a cost-effective and flexible solution for manufacturing large parts and components. That said, with the majority of the 3D printers currently available having been developed for smaller parts, what is the outlook for 3D printing technologies that can print larger parts like turbine blades and whole aircraft wings? Today’s article will explore the large-scale 3D printing technologies that are currently available, as well as current applications that showcase the power of large-scale 3D printing. What is large-scale 3D printing? As a manufacturing technology, 3D printing is increasingly finding its place. The technology is used in applications as diverse as split bearings, automotive components, medical implants and footwear. However, what these applications have in common is that the parts being produced are all of a relatively small size. Admittedly, large-format 3D printing is still a rather niche technology. However, it has the potential to solve many challenges manufacturers face when producing larger parts. Components of considerable size, like aircraft wings, are heavy and cumbersome and require longer setups and larger tools to be produced. This ultimately translates into higher manufacturing costs and longer lead times. 3D printing could help manufacturers produce large parts faster and more cost-effectively. With the design complexity 3D printing offers, such parts could also benefit from key advantages like lightweighting and enhanced performance. Finally, if large components can be printed in a single print run, as opposed to being printed in parts and then assembled, this also has the added benefit of reducing assembly times. When it comes to large-scale 3D printing, there are a number of technologies that fit the bill. Below are some of the commercially-available large-scale 3D printing technologies that you should be aware of. One of the largest 3D printing technologies currently available is Big Area Additive Manufacturing (BAAM). 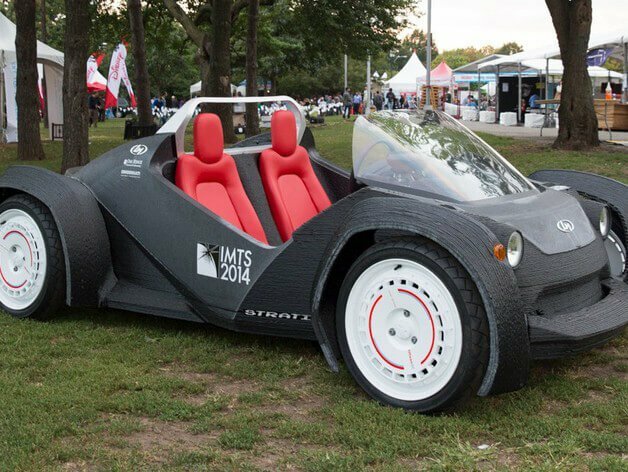 Developed by Oak Ridge National Laboratory (ORNL) in partnership with Cincinnati Inc., BAAM first appeared at IMTS 2014, where it was used to 3D print an entire car. The 3D printer, which uses an extruder placed on a gantry system, can create parts of up to 6 x 2.4 x 2 m using thermoplastic materials like ABS, PPS, PC, PLA and PEI. Since its introduction, BAAM has been used in several applications, from full-size prototypes of a submarine hull to 3D-printed self-driving vehicles. 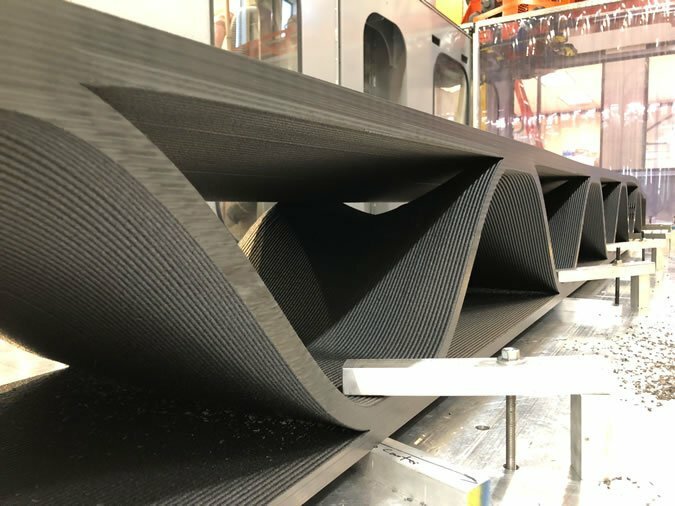 Large Scale Additive Manufacturing (LSAM) technology, developed by US company Thermwood, is another that has an exclusive focus on industrial production. First unveiled in 2016, an LSAM 3D printer has a build envelope of 10 x 40 ft (approx. 37 sqm) and can print objects both horizontally and vertically. One of the unique features of the LSAM 3D printer is its hybrid approach to producing parts, combining additive and subtractive technologies. It comprises a 3D printing gantry and a second trim gantry — the latter is, in actuality, a five-axis CNC router. This combination means that all the steps for part production can be carried out on the same machine, speeding up the manufacturing process. The LSAM 3D printer also features an extruder screw design which is made from special steel alloys. With this design, its print head can print with temperatures as high as 450°C, making it possible to manufacture large parts that require high-temperature composite thermoplastics. 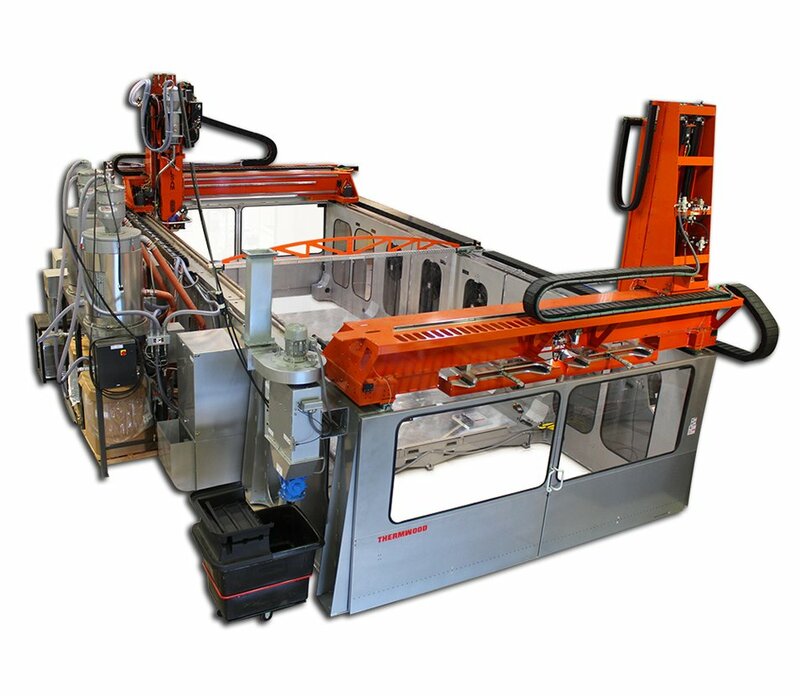 Thermwood’s LSAM machine has been developed for the production of industrial tooling, such as moulds and production fixtures for industries that include automotive and aerospace. 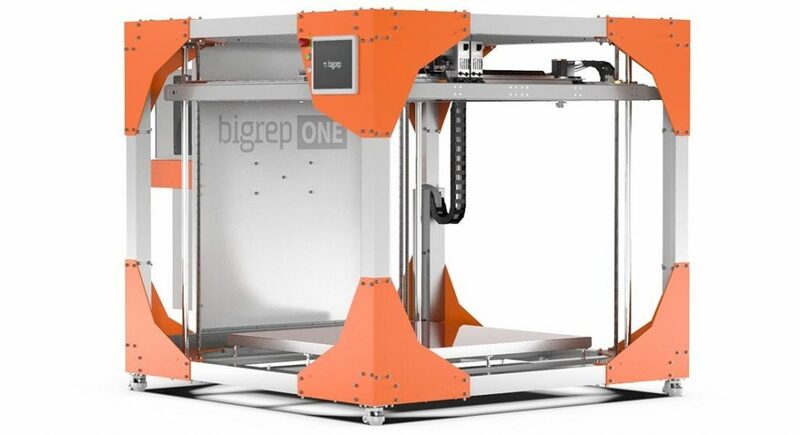 A well-known name within the world of large-format 3D printing, BigRep was founded in 2014 with the goal of making large-scale 3D printing as easy and affordable as possible. The company introduced its first machine — the BigRep ONE v1 — in the same year, and the machine boasts a rather large build volume of 1 cubic metre and has a price point of around $40,000. Five years since the original BigRep ONE 3D printer was launched, the BigRep ONE (now in its third iteration) still ranks as one of the lowest price-per-volume machines available. BigRep’s line of 3D printers fills the market gap between small desktop 3D printers and larger, more expensive industrial printers, and targets small and medium design and manufacturing companies. In the world of metal 3D printing, Sciaky offers some of the largest metal 3D printers around, driven by its Electron Beam Additive Manufacturing (EBAM) technology. For example, the EBAM 150 system has an impressive build volume of 3708 x 1575 x 1575 mm. EBAM uses a process similar to welding, where an electron beam is used to melt metal in wire form. This means the technology is well-suited to processing a wide range of weldable materials, from titanium to Inconel and stainless steel. Sciaky positions its AM system as a faster, more affordable alternative to large-scale forgings and castings. The company’s patented Closed-Loop Control system enables the manufacture of metal parts with enhanced properties and microstructures for applications in the military, the navy and aerospace. Similarly to EBAM, Wire Arc Additive Manufacturing (WAAM) also uses wire feedstock but melts materials with the help of an electric arc. WAAM can make parts up to 10 m in length, using metal alloys like titanium, nickel, stainless steel, aluminium and bronze alloys. WAAM can be used to produce large metal parts such as pressure vessels and panels for aeroplane fuselage. In addition to end-part production, the technology is an ideal choice for repair and maintenance operations for specific components like turbine blades, and also moulds and dies. Perhaps the most well-known manufacturer of large-format sand 3D printers is voxeljet, which has been active in this area since 2002. 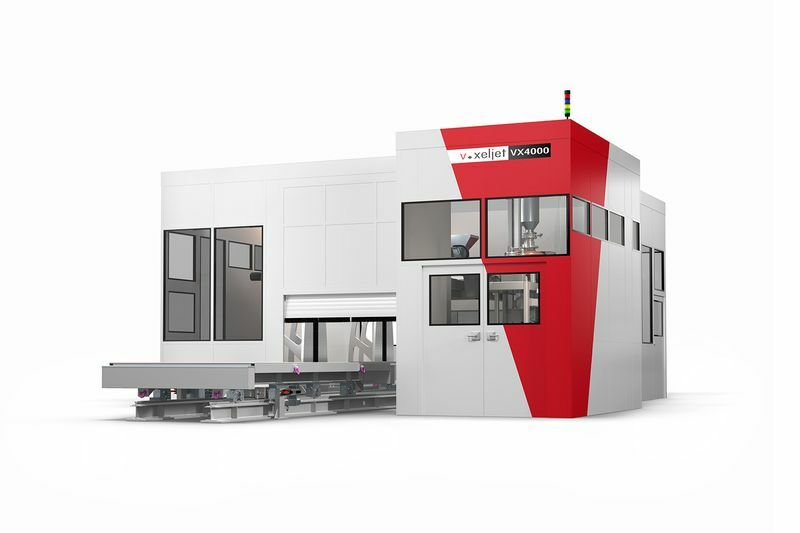 In 2011, voxeljet introduced the VX4000, which is one of the largest sand 3D printers to date, with a build volume of 4 x 2 x 1 m.
Alongside voxeljet, ExOne offers professional-grade sand printing systems, with a maximum build volume reaching 2.2 x 1.2 x 0.7 m.
Both Voxeljet and ExOne’s 3D printers use a process called Binder Jetting, where a liquid binding agent is selectively deposited onto a layer of sand to join sand particles together. Sand 3D printing is particularly beneficial for the foundry industry, as it offers a faster and more cost-effective way to create large and complex sand moulds and cores for metal casting. As we’ve seen, being able to 3D print large parts offers companies a range of benefits. Below, we’ll take a look at how three different industries can leverage large-scale 3D printing to speed up production, accelerate delivery, reduce material waste and create new geometries unachievable with traditional manufacturing. For the aerospace industry, 3D printing has, by and large, been used to produce small and medium-size parts and tooling, helping manufacturers save time and reduce costs. However, large-format 3D printing also offers some unique opportunities for the sector. The benefits of this include reducing long lead times and material waste. Typically, producing large structural parts with traditional methods like forging and machining can take up to a year. In addition to long lead times, traditional subtractive methods can also generate a lot of material waste — up to 80% in some cases. Large-scale 3D printing, on the other hand, can be used to produce parts in a fraction of the time and with reduced material waste. More importantly, the technology can print multi-part components as a single part – a technique known as part consolidation. With this approach, assembly times can be significantly reduced. One of the most commonly-used large-format 3D printing technologies within the aerospace industry is Sciaky’s EBAM technology. 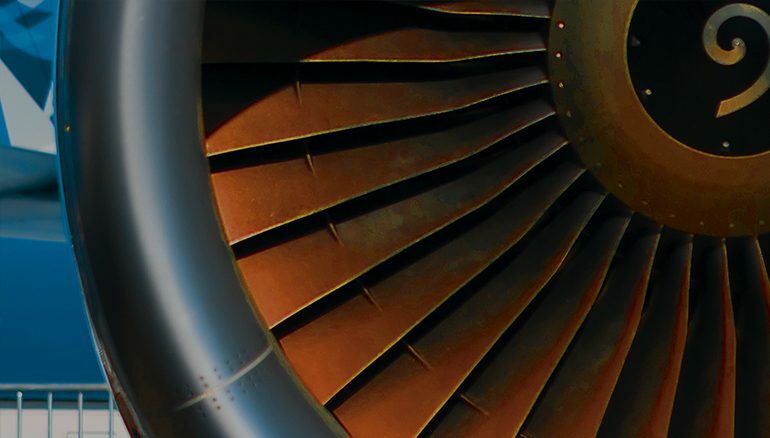 A key reason for its use in aerospace applications is its ability to produce high-performance parts up to 6 m tall and 1.2 m much faster than would otherwise be possible with traditional manufacturing techniques. Global aerospace and defence company, Lockheed Martin, was among the first to use EBAM, having used the technology since 2014. 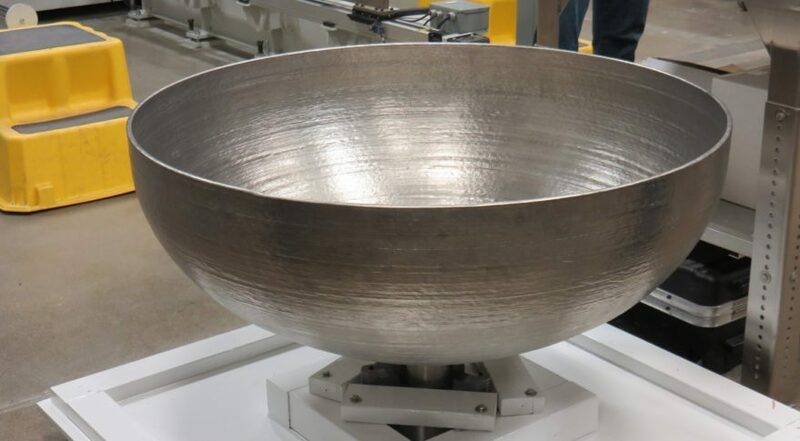 With this large-format 3D printing capability, the company is able to 3D print giant titanium domes, each measuring 116 cm in diameter, for its satellite fuel tanks. Qualified last summer, the 3D-printed domes were developed as a part of a multi-year development program to create high-pressure tanks to carry fuel on board satellites. The satellite fuel tank consists of a traditionally-manufactured titanium cylinder that forms the body and two 3D printed domes that serve as caps. The three parts are welded together to form the final tank vessel. By leveraging EBAM’s ability to deposit the exact amount of material needed, Lockheed Martin was able to reduce material waste by 80%. 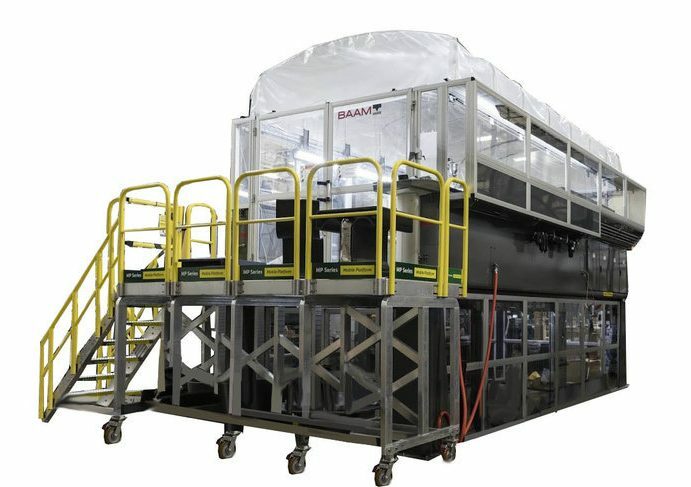 Furthermore, the high deposition speed of the EBAM system, which can reach up to 11 kg per hour, enabled the manufacturer to deliver the domes in three months instead of two years – a whopping 87% reduction in lead time. Lockheed Martin believes that such tanks are a step towards transforming the way the company designs and delivers space technology. And large-format 3D printing plays a key role in helping the company to move in that direction. While Lockheed Martin has found use cases for large-scale metal 3D printing in end-part production, polymer 3D printing is changing the game for tooling production at Bell. In the aerospace industry, producing tooling can be a long and expensive process. Looking to overcome these challenges, Bell turned to Thermwood’s LSAM technology to produce large moulds for helicopter blades. 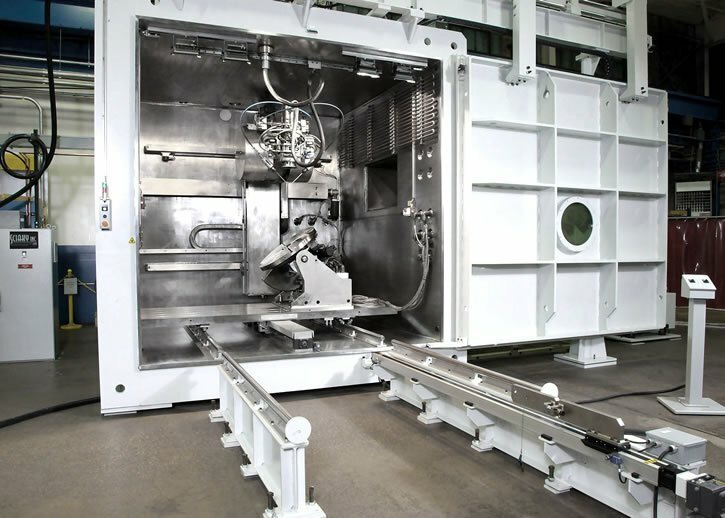 The key requirements for the tooling were good surface finish, tight tolerances and the ability to withstand autoclave processing — a technique which helps to strengthen composite parts that will be exposed to elevated pressure and temperature. LSAM was ideal for such an application for two main reasons. 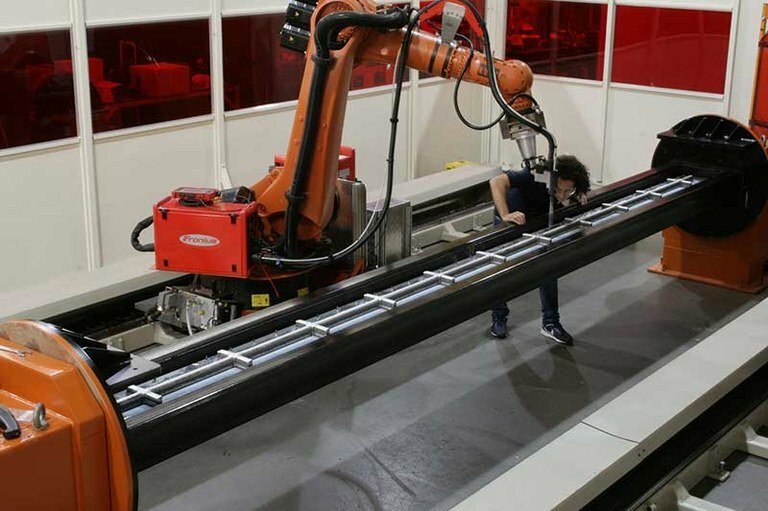 First, it allowed the 6 m long tool to be manufactured from a high-performance carbon-reinforced PESU material, which can withstand high pressures and temperatures. Second, since LSAM is a hybrid technology, a part can be 3D printed and finished without the need for a second machine — helping to further speed up the production process. These benefits enabled Thermwood to manufacture the tool in just a few days as opposed to the months it would take with traditional processes. Furthermore, additive technology made it possible to design internal support structures in a way that they were not touching the back side of the mould cavity. As a result, air could flow freely under the entire formed part in the autoclave – which helps to cure the part more consistently. This achievement points to the new design possibilities that large-scale 3D printing unlocks for large and technically complex aerospace components. While 3D printing in the construction industry is still very much at an early stage of adoption, the technology does offer promising potential for the sector. For example, one of the emerging trends for 3D printing within the construction industry is 3D-printed precast formworks. In construction, formwork refers to a temporary mould into which concrete is poured and formed. Formworks are used to create anything from bridges to foundations and the walls of a building. Typically, formwork can be produced manually using wood. However, wooden formwork isn’t particularly durable and will often start to break down after 15 to 20 castings. Additionally, the manual process inevitably limits the scope of the possible shapes and geometries to what is humanly possible to produce. In such a scenario, large-scale 3D printing can significantly simplify the process of creating formwork whilst enabling greater complexity and durability for large mould structures. 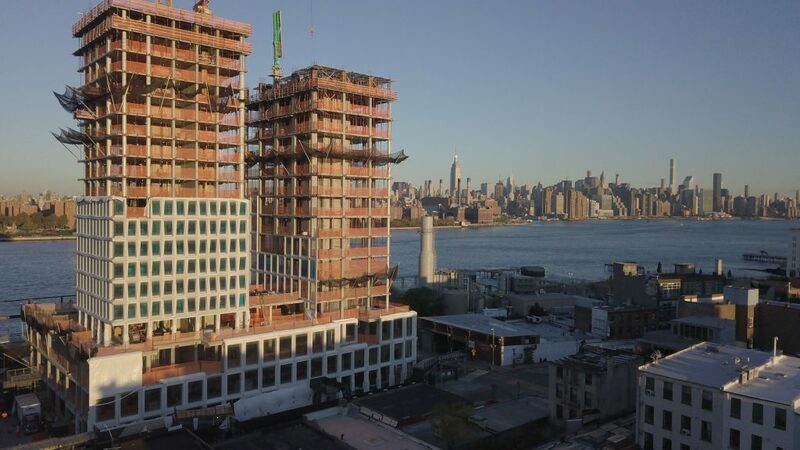 One recent example of using 3D-printed formwork involves a large-scale renovation project for a 42-story residential and commercial building in New York City. Gate Precast, a company which had been working on the new facade for the building, found that creating wooden moulds for the project would be a major undertaking that could take up to 9 months to complete. The moulds required were large — some of them measuring up to 2.6 x 1.7 x 0.5 m, further adding to the long production times. To speed up the process, the company decided to experiment with 3D printing, partnering with Oak Ridge National Laboratory (ORNL) to use its BAAM technology. Thanks to BAAM, the company was able to print moulds between 8 and 11 hours each, with an additional 8 hours of machining to achieve the desired surface finish. The moulds were made with carbon fibre-reinforced ABS, a common thermoplastic mixed with chopped carbon fibres for additional strength. The result is a strong mould that can support as many as 200 concrete pours in its lifetime, compared to 15-20 pours for a wooden mould. The company believes that without the 3D-printed moulds and BAAM, it would have been impossible to create the forms within the timeframe required for this project. In this case, 3D printing provided value in producing more durable and more complex moulds in a shorter timeframe. That said, while this approach for creating formwork moulds has its advantages, 3D printing is not going to replace wooden formwork. Yet, this project proves that 3D printing of large parts offers a range of benefits for the construction industry, giving architects a viable precast mould manufacturing alternative. Large-format 3D printing is increasingly coming into focus in the foundry industry. The foundry business involves the production of metal castings by melting and pouring metal into specially shaped moulds and cores. When it comes to metal casting processes, the technology can help to bypass the costly and time-consuming aspects of creating patterns, cores and moulds. Let’s take conventional metal casting as an example. To go from a drawing to producing precise moulds and patterns and, finally, to the finished cast part, can take months. Foundries will also typically have to store moulds in inventories, which can be expensive in the case of larger or rarely-used moulds. A shortage of skilled pattern and mould-makers is another challenge foundries often come up against. 3D printing can be used as a tool within the metal casting industry to help deal with the challenges above. One of the advantages of the technology lies in the considerably simplified mould construction process. Since 3D printing requires only a design file, the manual mould-making process and assembly of the complex cores can be eliminated. Streamlining production in this way allows a foundry to create moulds and patterns within a few days instead of weeks and months. Furthermore, 3D printing can be used to produce moulds on-demand, helping a company to minimise its physical inventory and thereby warehousing costs. Teignbridge specialises in the manufacture of custom propellers and vessel propulsion systems for tugs, luxury yachts, fishing trawlers and ferries. Since it was founded 40 years ago, the company has been using the multi-stage casting process in the production of its products. One of the stages involves making a pattern, a model of the final object. The pattern is placed into a sandbox to create a mould. Often, this is a labour-intensive and time-consuming process and first requires milling a pattern from a block of wood or polystyrene. To reduce the time needed to create a pattern, Teignbridge decided to opt for large-format FDM 3D printing, using BigRep’s BigRep ONE 3D printer. Having a 3D printer with such a big envelope in-house enables Teignbridge to print the entire plastic pattern in one go and brings tangible benefits of reduced cycle time and labour input. For example, when using a traditional approach to making a pattern, a skilled CNC operator can spend up to 20 hours on milling, section assembly and post-processing. 3D printing, in contrast, allows Teignbridge to automate the pattern-making process, reducing labour input by 90%. In metal casting, 3D printing is increasingly used as an alternative way to produce patterns and moulds. In addition to large-format FDM 3D printing, companies also have a sand 3D printing option. Sand 3D printers eliminate the pattern-making step by creating a sand mould directly. Although sand 3D printing systems can be as large as 4000 x 2000 x 1000 mm, they tend to be quite expensive. That said, companies are beginning to acknowledge the advantages of 3D printed patterns and moulds, as they make the casting process faster, more flexible and cost-effective. Large-format 3D printing currently remains rather a niche technology. One of the key reasons for it may lie in the fact that many companies are still not aware of the benefits and possibilities of additive manufacturing in general, let alone its large-format aspect. As a result, companies are struggling to find an appropriate business case. Complication this is that many large-format 3D systems remain prohibitively expensive. As a result, companies which would want to experiment with the technology to find the right application, cannot afford it. Fortunately, this starts to change, as the market for large-scale 3D printing continuously grows, providing some more affordable options like BigRep’s 3D printers. Ultimately, the technology for printing larger parts has the potential to expand to other markets and applications. Automotive could be one of them. Automakers could use large-format 3D printing to prototype bigger parts such as spoilers and car panels, which are difficult to print with current machines. Clearly, the demand for large-format 3D printing is there, driven by the benefits of reduced lead time and cost. Now, the industry needs to continue to advance the technology to fill that need, enabling other industries to open up to bigger opportunities, both literally and figuratively.